America idolizes superheroes. They represent what we all hope we can be: stronger, faster, the epitome of good. Captain America represents all of that and more. He represents an America that was and an America that no longer exists. “Captain America: The Winter Soldier” emphasizes this fact by showing a mirror to the audience. It paints a picture of an America that creates digital profiles of its citizens in order to determine if they are a threat. It studies the metadata of everyone in a sweeping violation of rights. Without granting trials, they make the judgment. This is a government that has become the trial, the jury and the judge. Captain America recognizes this and proclaims, “I thought punishment usually came after the crime.” This is our America now. This is our unfortunate reality. When Capta in America and Black Widow uncover the underground supercomputer that holds the memory of Dr. Zola, he explains the connection between HYDRA and S.H.I.E.L.D. that has been festering for over 50 years. Similarly, the breakdown of our system is a product of progressive minds on both the left and the right. In the end, Baron Wolfgang von Strucker jokes that HYDRA and S.H.I.E.L.D are two sides of one coin. This merger of big business and big government creates a world where not even Captain America can salvage what once was. Nick Fury wants to save S.H.I.E.L.D. in the process of taking down HYDRA. He still believes that what they are doing is noble and inherently right. Captain America reminds him that if they are to take down the establishment, it must all fall. Otherwise, they are fighting for nothing. We must do the same. We, as activists, must remember that this system that is set up to fail has to be dismantled, piece by piece. Captain America knows he can’t do it alone, and when he is in S.H.I.E.L.D. he makes a public plea to the people working at S.H.I.E.L.D. to join him and stand up for the right thing. There are some that realize they may not be working for the right side. One worker in particular refuses to comply with his orders and does not want to launch the weapon. And while many more join forces with Captain America there are some who do not. We must also realize that there will be people we cannot win over with our defense of rights. For whatever reason, either empathy or disregard, there will always be those who will not listen. Instead, we must work to educate and inspire those who will someday realize they are the ones who can refuse to initiate the launch sequence, knowing the consequences of doing so. There is no question the film was written with current civil liberties violations in mind. Directors Anthony and Joe Russo said in an interview with Mother Jones: “[Marvel] said they wanted to make a political thriller,” says Joe Russo, who directed the film with his brother Anthony. “So we said if you want to make a political thriller, all the great political thrillers have very current issues in them that reflect the anxiety of the audience…That gives it an immediacy, it makes it relevant. So [Anthony] and I just looked at the issues that were causing anxiety for us, because we read a lot and are politically inclined. And a lot of that stuff had to do with civil liberties issues, drone strikes, the president’s kill list, preemptive technology.” It is incredible and surprising to see Hollywood take on current Constitutional issues to influence pop culture, a war designed to distract and not inform. I, personally, am encouraged by this message and hope to see more writers and directors in Hollywood address these issues without a left or right bias, but simply with truth in mind and courage in their script. One of the most surprising aspects of “Captain America: The Winter Soldier” is the direct correlation between Black Widow and Edward Snowden. Black Widow uploads highly sensitive S.H.I.E.L.D. data to the internet. She does this even as the leader, Pierce, is telling her that this will in turn expose herself as well. Knowing it will destroy the alias that she has worked so hard to build up, she uploads the files and even jokes that it is trending on social media. Afterwards, it shows her at a government hearing where she is being criticized for destroying the national security network that the government and S.H.I.E.L.D. have spent so much money on creating. There is no disputing that Edward Snowden broke the law, but in doing so he also honored his oath to defend and protect the Constitution. In the words of Senator Rand Paul, who is watching the watchers? Overall, “Captain America: The Winter Soldier” is an amazing film that directly forces the audience to question the idea of trading liberty for security. Benjamin Franklin once said that those who would trade liberty for security deserve neither. I would like to think that Captain America would agree with him on that. 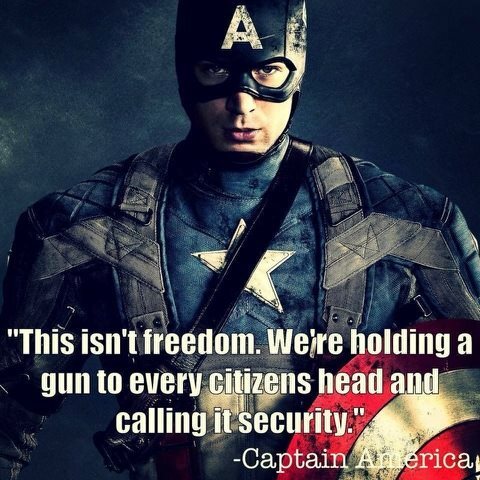 When Captain America was shown the weapon technology that would be capable of taking out threats before they emerged, he cried “This isn’t freedom; it’s fear.” Next time you look around you at an airport and watch as citizens are being groped and displayed, naked on the screen for the security officer’s gaze, ask yourself: is this freedom..or fear? This entry was posted in Movie Reviews and tagged Captain America, drones, Liberty, NSA, Snowden. Bookmark the permalink.